When you’re given new information, you need to figure out what to make of it. Interpretation is the skill you use to understand what you’re being told and how to apply it whether you’re learning information in a classroom, or your coach is giving you instructions on the field. Without the ability to interpret, you’ll have trouble figuring out what’s really being said, or you’ll be slow on the uptake. Not all of the information you get is legitimate, or even useful. One of the most valuable critical thinking skills to develop is the ability to evaluate the information you receive. If you’re good at evaluating information you receive, your research will be better in the classroom because you’ll be able to tell a good source from a bad one. You will also be able to tell if peoples’ opinions of you on the field are useful, or if they should just be ignored. If you’re bad at evaluation, you may be easily swayed by the opinions of others. Your ability to self-regulate is one of the most important critical thinking skills to hone in on. Self-regulation is your ability to look intelligently at your own thinking processes, and to draw conclusions and take actions from it. It’s the skill that helps you decide when you have studied too long and you need to take a break because your brain’s getting foggy. It helps you decide when you don’t know enough about a given exercise your coach has asked you to do, and therefore to seek help. Developing skills like interpretation, evaluation and self-regulation aren’t easy, but you can do it with hard work. 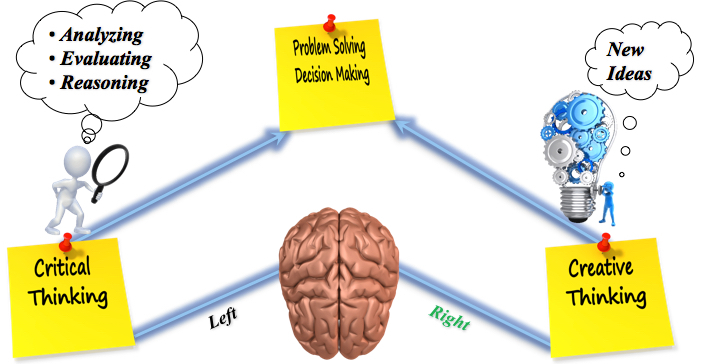 Deliberately addressing problems slowly and carefully is one way to develop critical thinking. Another is to keep a journal where you reflect on your day, emotions and experiences. Critical thinking skills are crucial for success in the classroom, on the playing field, and in life. By developing them, you should be able to significantly improve your grades and your team’s success, as well as gain a reputation as a thoughtful, mature, responsible individual. To learn more about how critical training can change the lives of your student athletes click on the link or complete the form below.